Dr Jawahar is one of the leading educationists in the world and has been hailed for his innovation Think Curriculum for which he has been awarded an honorary doctorate by Columbia University. He has been instrumental in increasing career awareness among thousands of youth every year in the backward areas of India in Orissa, Chhattisgarh and Jharkhand with the help of Tata CSR, Rungta Group and Dainik Bhaskar called Career Yatra. He has also been the proponent of Think for India movement for increasing employability and entrepreneurship skills in school and college education. His TED talks on ‘Thinking in education’, ‘Generation and change’ and other topics have been well received across the world. He has been involved with the UN and The Times of India in organising Explora – an expedition through the minds of youth in US and India respectively. 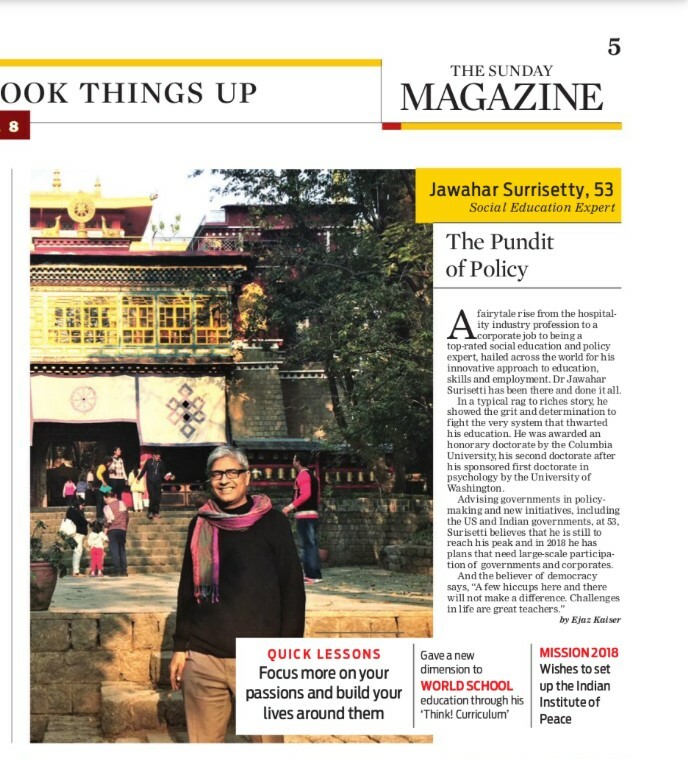 Dr Jawahar has been advising governments internationally and in India as well as mentoring startups. He is instrumental in ideation and strategy and ideation in the corporate world and Smart Cities. In his wish for the future, he has mentioned that he would like to make India the capital of peace in the world by building the Indian Institute of Peace in India and inviting all gen-next peace leaders who could lead the globe into peaceful coexistence in future. He has authored bestselling books ‘Mama and me’ and ‘Go to hell or come to me ‘ on teens and children and poetry in peace and girl child which have received accolades internationally and have featured in books published by UN affiliates. His platform Religion of youth is a mouthpiece of the youth if the world to voice their opinions, desires and issues and participate in nation building. His enterprise MyBeti works for the education and health of the girl child in India.